I met Thinking For Tuesday last summer in Manchester, when they should have won Female First‘s Band Wars event. We arranged to hook up and shoot some promo style stuff once I’d moved down south. The band had a couple of ideas they wanted to try out, and I had something in my head involving a marine distress flare. This location is a disused (or at most seldom used) barn in Hampshire. The building was in a serious need of repair to become usable again, having obviously sat empty for many years. Outside were 4ft weeds and foliage, and a 1987 Mercedes-Benz 500 covered in moss blocking one entrance. Luckily a door to the side was unlocked, and we ventured inside to find an area suitable to shoot in. Progressing through a series of small rooms, we came across a narrow stairway with no rails. At the top was a large space, with low roofing beams. Despite the floor seeming sturdy enough, sheets of ply were covering quite large holes. On the other side was an entrance to a larger area (shown on the picture below, top left). The only way to access the lower area was via the upright ladder, also shown in the picture. To give an idea of size, the ladder wasn’t wide enough for me to fit both of my size-12’s on a rung at a time. With the ladder turning out to be surprisingly stable (although it has probably collapsed since we left…) we could access the lower space easily, and set up kit. The band had managed to acquire four handheld flares, two orange smoke canisters and four parachute flares. All were out of date by three years, but still suitable for non-emergency situations such as this. The first handheld flare turned out to be a dud, but the second worked well. This was used as a test outside so we knew what we were dealing with, and how the flares would act. Inside the barn, the first flare we activated was the orange smoke canister. This in hindsight wasn’t the brightest idea we’ve had. Seriously underestimating how much smoke was released by a single canister, the entire barn was soon filled with a dense, caustic fog, which took 20 minutes to clear before we could use the barn again. From the outside, a coloured smoke was pouring from open windows and holes in various locked doors, but fortunately not enough to cause alarm to anyone passing by. Once the fog had cleared, we moved on to the original idea. The third handheld flare worked well, but the relatively short lifespan of these things meant I had to work fast to sort out the white balance and exposure settings. Unfortunately the fourth flare was also inactive, so more shots were impossible to get. A short time was also spent playing with fog and backlighting. Getting the lighting right was quite a quick process, learning that a lot less was needed for the barn than previously thought. In the back, a Canon 580EX II on 2/3 power was set behind smoke, while the faces are illuminated by a single Bowens at 200w(ish) reflected into a silver umbrella and then bounced off a white wall behind. An idea the band had was to emulate/recreate/pay tribute to Dave Clark Five’s album cover for Catch Us If You Can (which is pictured below this next shot). 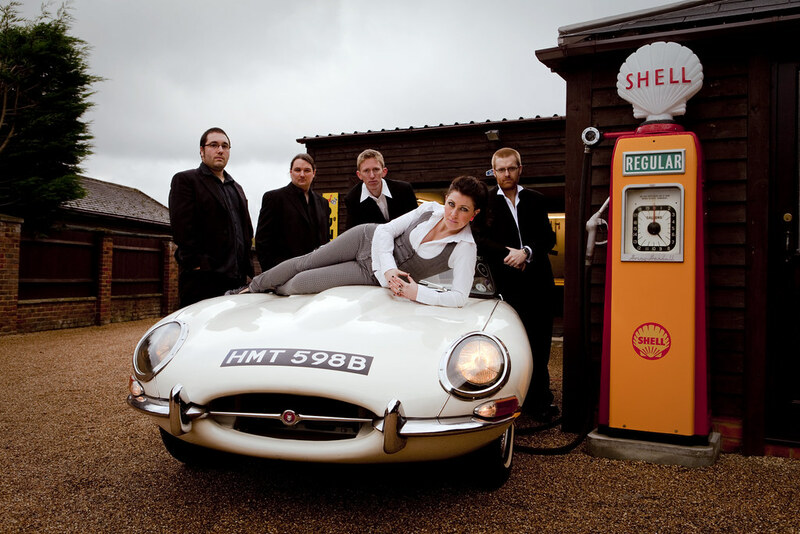 Singer Karen had access to the very same Jaguar E-Type Dave Clark Five used (check out the registration plate), so we borrowed it for a bit to pose on. This car is amazing, and harks back to the days of obstinate luxury and showing wealth. Ultimately everything turned out just as intended, but some more time spent with the flares would be fantastic. if you’d gone to Brighton you may have been able to recreate the pic a bit more accurately. Having said that well done! I always wondered what happened to that car! Hey J, thanks for the comment! I didn’t know where the original shot was taken, so maybe we’ll have to get down there in the summer to try and make it more authentic!